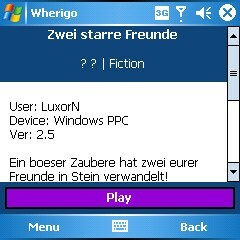 I want to use the Wherigo-Player on my Fujitsu Siemens Pocket Loox T810. Everything works well including the bulitin GPS. Because the T810 features a square display, the application doesn't fit the display correctly. But, the default game screen doesn't display this bar, so I'm not able to see and use the "tasks"-menu item. Is it possible to implement this scroll bar there? I second this request - as a Treo800w owner (WM6 with a square screen) I have the same issue. 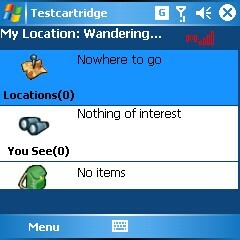 The Treo is a popular phone, with the 800w having built in GPS - it's an ideal platform for this. Everything works except for screens that don't have the scroll bar. I have the same problem for my Palm Treo Pro.